A Good Book Drive is back this November. Founders Cory Ashworth and Lizzy Karp are gearing up for the second annual book drive, aiming to bring stories to a new generation of readers and support kids in need of new books. Last year, I was humbly included in a long list of local media personalities asked to donate and showcase a favourite reading selection from childhood. Cory, also a morning radio host from 100.5 The Peak, interviewed me about my book pick. It's been released it in anticipation of this year's November month-long drive for donations. Have a listen. 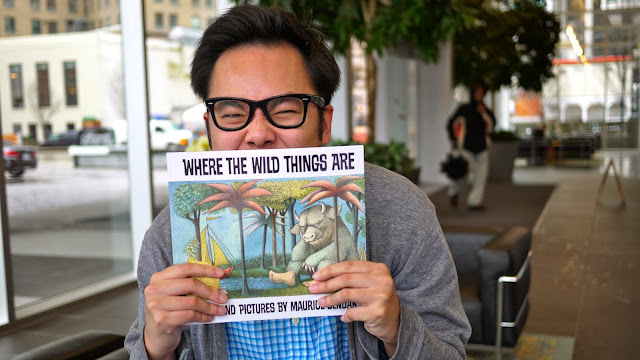 I talk about the influence of author Maurice Sendak's vivid artwork on my own imagination, when it came to world building, in his picture book, Where the Wild Things Are. FYI, Mayor Gregor Robertson and I evidently share the same taste in children's literature. Last year, over 1,000 books were donated to the Writer's Exchange. Running through November, A Good Book Drive is inspiring Vancouverites to donate a new copy of their favourite kid's book and deliver it to set locations throughout the city in support of the Frontier College's Waiting Room Literacy Pilot project. More | YVArcade / V.I.A.